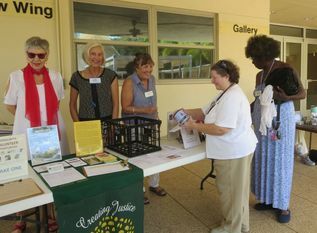 Members and friends of the Unitarian Universalist Church of Sarasota do justice. We are involved in the local community and partner with national and international advocacy agencies. We support and create opportunities to participate in social justice and climate justice initiatives through information sharing, service opportunities, petitions, letter writing campaigns, fundraising and peaceful gatherings. Bring your passion and your energy and join us! The committee meets at the church on the second Tuesday of each month (except July) at noon in the Reeb Room. New members, friends and guests are always welcomed. Join the Social Justice mailing list here to receive meeting notices and announcements. On Sundays, visit our contact table in the courtyard. To contact the committee, write to justice@uusarasota.org. You can find a list of community volunteer opportunities on our Volunteer page. ​Recent tragic events in Florida may have inspired you to be more of an activist. The Social Justice Committee wants to help make that easy with our new resource, the Activist Corner. We've compiled a list of the names, street addresses, telephone numbers and emails for local, state and federal officials, all in one place. We also have links to local activist organizations if you'd like to become more involved. Click here for past Committee meeting minutes of the Social Justice Committee.